This page is about the light tank H.39. For the premium version, see H.39 «Cambronne». The Char léger modèle 1935 H modifié 39 (Hotchkiss light tank model 1935 modified 1939) is a reserve rank I French light tank with a battle rating of 1.0 (AB/RB/SB). 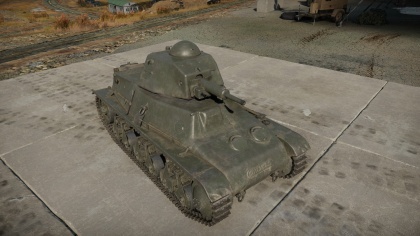 It was introduced in Update 1.75 "La Résistance" and replaced the H.35 as one of France's two reserve vehicles in Update 1.85 "Supersonic". Compared to its predecessor, the H.39 features a serviceable gun, thicker armour, and a significantly more powerful engine, which makes it, when fully upgraded, surprisingly speedy on flat ground for low level French tanks. Nevertheless, this vehicle's gun and mobility are below average compared its peers from other nations. While it is mobile in a straight line, it maneuvers slowly and its narrow tracks slow it down substantially cross-country. 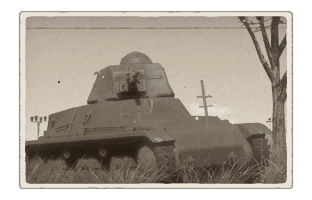 The H.39 should be played as a close support tank, best utilized in urban maps and following its teammates while waiting for a good shot opportunity. With a rather constant 45-50 mm effective thickness from all sides, this tank can be a hard nut to crack if spotted at a good distance (500+ m), and can take a good beating up close if care is taken to properly angle and avoid tanks with especially potent guns. However, its armour should not be relied upon; most reserve tank guns are capable of penetrating its raw armour thickness and have faster reloads, so hard cover should be utilized generously. With only 2 crewmen, any penetrating shot could be your last. The 37 mm SA38 has significantly better penetration and post-penetration damage than its predecessor, but has a longer reload rate than its peers. Know your enemies' insides well, target their gunners first or immobilize them by shooting at the engine, and take care to make every shot count. Avoid exchanging shots at long distances as your gun's penetration values decrease heavily. Turret ring is 35 mm thick with a 5 mm protective collar. Trench-crossing tail at the hull rear is 5 mm thick. Ammo racks of the H.39. 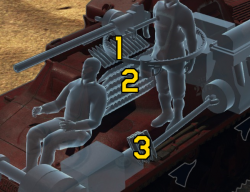 Use the same tactics as with other French rank 1 vehicles; follow the pack and take shots whenever the opportunity shows. Use your decent mobility to assist in flanking manoeuvres (i.e. in urban maps) and put shots into your enemies' weak sides. Find hard cover that can't be shot through, angle strongly, and poke in and out between your shots, as your reload can't match that of your opponents. On maps with hilly terrain, stick with your teammates near the capture point, go hull-down, and wait for anything to fall in your sights. Try to immobilize your target on your first shot. Get back into cover between reloads and pop out a few meters away from your last spot.